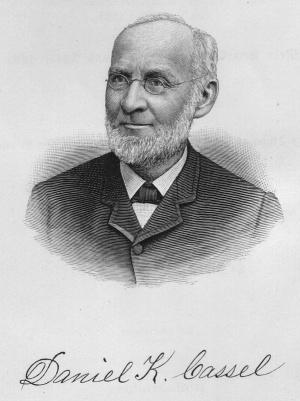 Daniel K. Cassel was born on 22 April 1820, in Upper Salford Township, Montgomery County, Pennsylvania, the son of farmer-weaver Jacob and Wilhelmina Kulp Cassel, and the sixth generation from Hupert Cassel, the Mennonite immigrant weaver who settled in Germantown, Pennsylvania, about 1720. Daniel, the oldest of four children, was early taught the art of weaving by his father. In his youth he manifested studious habits, supplementing his limited grammar school experience with intensive private reading, often late into the night. At the age of nineteen he began to teach in local schools and for twenty years continued to do so, introducing such new subjects as geography and higher mathematics into the simple curriculum of the day. During these years he published two German booklets: a book of prayers and songs, and a catechism for religious instruction of his pupils. In all probability Daniel attended the Salford Mennonite Church in these early days. He organized a Sunday school at Alderfer's, below Harleysville, in 1855, the first one in the community. On 16 February 1845 he married Elizabeth Kolb, daughter of Jacob Kolb, preacher at Salford. Three sons were born to them: Simeon in 1846, Jonas in 1849, and Abel in 1852. In later years Daniel and Elizabeth Cassel lived in Philadelphia at 4333 Germantown Avenue. The leisure of later years and his return to romantic Germantown stimulated the religious and historical activities which he had anticipated all his life. He joined the historic Germantown Mennonite Church (General Conference Mennonite), serving as deacon from about 1886 until his death. In 1888 he published his well-known History of the Mennonites, the first extensive history of American Mennonites. In spite of its errors, disunity, and sketchiness, it was a noble pioneering achievement in the days when there was little interest in Mennonite history. It is especially valuable for its congregational histories and various documents preserved and printed in full. Two years later it was expanded and reprinted in German under the title, Geschichte der Mennoniten. During these years he also compiled genealogies of the Rittenhouse, Kulp, and Cassel families. The titles of his known works are: Eine schoene Sammlung auserlesener Gebete und Lieder zum Gebrauch der Jugend (Sumneytown, 1844); Katechismus oder kurze und einfältige Unterweisung nebst den Zehn Geboten (Skippachville, 1851); History of the Mennonites (Philadelphia, 1888); Geschichte der Mennoniten (Philadelphia, 1890); A Genea-Biographical History of the Rittenhouse Family (Philadelphia, 1893); A Genealogical History of the Kolb, Kulp or Culp Family (Norristown, 1895); A Genealogical History of the Cassel Family (Norristown, 1896); The Family Record of David Rittenhouse (Norristown, 1897). He was an early stockholder and member of the Bethel College Corporation controlling Bethel College, North Newton, Kansas. Two of his belongings, a large volume of the four Gospels in twelve languages and a manuscript copy of his will, are now in the possession of Jacob R. Fretz and the writer respectively. He died on 19 February 1898, and was laid to rest in the historic Germantown burial ground beside his ancestors. Cassel, Daniel Kolb. A Genealogical History of the Cassel Family in America: Being the Descendants of Julius Kassel or Yelles Cassel, of Kriesheim, Baden, Germany : Containing Biographical Sketches of Prominent Descendants, with Illustrations. Norristown, Pa: Morgan R. Wills, 1896: 98 ff. Available in full electronic text at [Cassel, Daniel Kolb. A Genealogical History of the Cassel Family in America: Being the Descendants of Julius Kassel or Yelles Cassel, of Kriesheim, Baden, Germany : Containing Biographical Sketches of Prominent Descendants, with Illustrations. Norristown, Pa: Morgan R. Wills, 1896. Available in full electronic text at https://www.archive.org/details/genealogicalhist00cass. Cassel, Daniel Kolb. A Genealogical History of the Kolb, Kulp or Culp Family, And Its Branches in America, with Biographical Sketches of Their Descendants from the Earliest Available Records. Norristown, Pa: Morgan R. Willis, 1895: 61 f. Available in full electronic text at https://www.archive.org/details/agenealogicalhis00cass. Cassel, Daniel Kolb. A Genea-Biographical History of the Rittenhouse Family And All Its Branches in America, with Sketches of Their Descendants, from the Earliest Available Records to the Present Time, Including the Birth of Wilhelm in 1644. Philadelphia: Rittenhouse Memorial Association, 1893. Available in full electronic text at https://www.archive.org/details/familyrecordofda00cass . Cassel, Daniel Kolb. History of the Mennonites; Historically and Biographically Arranged from the Time of the Reformation; More Particularly from the Time of Their Emigration to America. Containing Sketches Fo the Oldest Meeting Houses and Prominent Ministers. Also, Their Confession of Faith, Adopted at Dortrecht, in 1632. Philadelphia: D.K. Cassel, 1888. Available in full electronic text at https://www.archive.org/details/historyofmennoni00cass. Cassel, Daniel Kolb. Geschichte der Mennoniten : Von Menno Simons' Austritt aus der Römisch-Katholischen Kirche in 1536 bis zu deren Auswanderung nach Amerika in 1683. Mehr speciell ihre Ansiedlung und Ausbreitung in Amerika. Enthaltend: Kurze Skizzen der einzelnen Gemeinden mit den Namen ihrer Prediger vom Jahre 1683 bis zur gegenwärtigen Zeit. Philadelphia: J. Kohler, 1890. Available in full electronic text at https://archive.org/details/geschichtedermen00cass. See also "One by One." The Mennonite (March 1898): 44. Fretz, J. Herbert. "Cassel, Daniel K. (1820-1898)." Global Anabaptist Mennonite Encyclopedia Online. 1953. Web. 19 Apr 2019. http://gameo.org/index.php?title=Cassel,_Daniel_K._(1820-1898)&oldid=144927. Fretz, J. Herbert. (1953). Cassel, Daniel K. (1820-1898). Global Anabaptist Mennonite Encyclopedia Online. Retrieved 19 April 2019, from http://gameo.org/index.php?title=Cassel,_Daniel_K._(1820-1898)&oldid=144927. Adapted by permission of Herald Press, Harrisonburg, Virginia, from Mennonite Encyclopedia, Vol. 1, pp. 522-523. All rights reserved.